Niagara Parks will mark the centenary of the iron scow with the unveiling of a new plaque. On August 6, 1918, a dumping scow broke loose from its towing tug about 1.6 km up river with Gustav F. Lofberg and James H. Harris aboard. 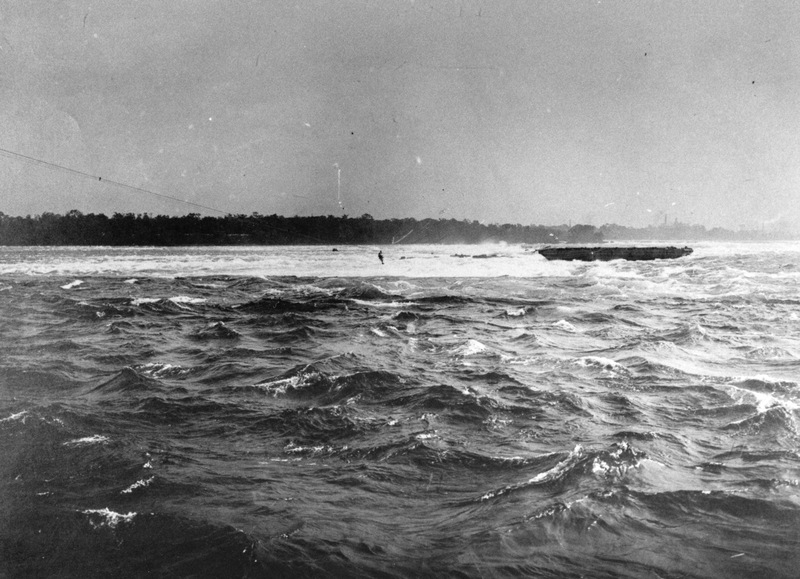 The men opened the bottom dumping doors and the scow grounded in the shallow rapids only 600 metres from the brink of the Horseshoe Falls. With the cooperation of The Niagara Parks Police, The Niagara Falls Fire and Police Departments, The U.S. Coast Guard and recently returned WWI veteran, William ‘Red’ Hill Sr., the two men were successfully rescued the next day by breeches buoy on a line shot out from the roof of the adjacent power house. Niagara Parks will mark the centenary of the iron scow with the unveiling of a new plaque. A ceremony with Niagara Parks Historian, Sherman Zavitz, will commemorate the occasion and acknowledge current emergency responders and family members of those involved in the 1918 event. As part of the celebrations, the Scow will be illuminated at night August 3rd to 20th. 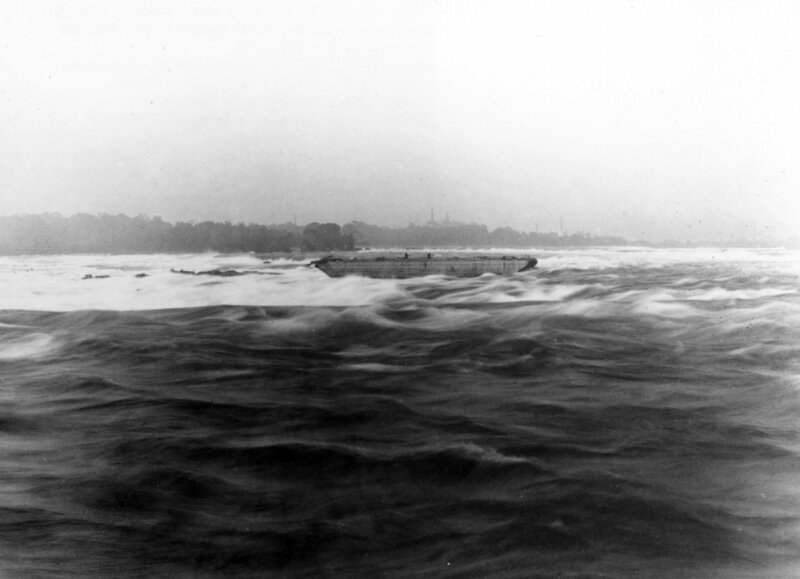 One of the most dramatic rescue efforts in the history of the Niagara River took place during the mid-afternoon of August 6, 1918, while involved with a dredging operation about 1.6 kilomtres above the Horseshoe Falls, a scow broke loose from its tug. 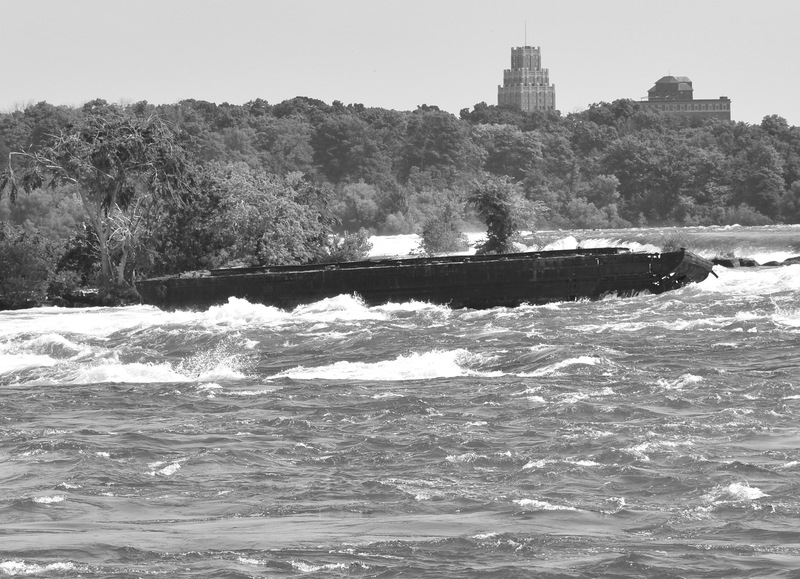 Moments later it drifted into the Niagara River’s midstream and headed towards the falls. On board the runaway scow were Gustav Lofberg, 51, and 53-year old James Harris. In spite of the mind-numbing fear that must have gripped the two men, they had the presence of mind to open the scow’s bottom dumping doors, flooding its compartments. This slowed the scow’s progress until it grounded on some rocks opposite the large powerhouse adjacent to this panel. The men were now marooned in the torturous upper rapids, about 200 metres from the Canadian shore and 600 metres from the brink of the cataract. 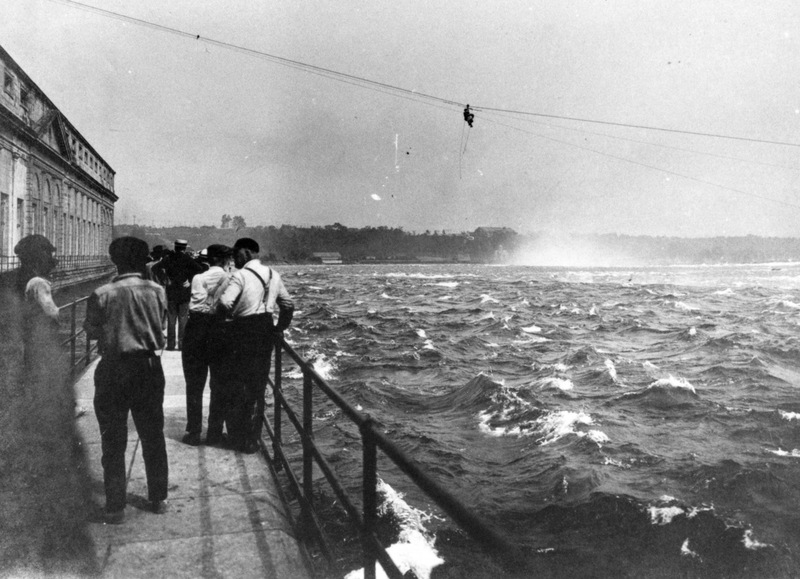 A lifeline cannon, rushed to the scene by the U.S. Coast Guard, was able to shoot a line from the roof of the powerhouse out to the stranded men. Harris and Lofberg tied this light rope to a crude windlass they had constructed. A heavier rope was then tied to the lifeline. At 9:30pm that evening, a breeches buoy (a canvas sling suspended from a pulley) was put in place on the heavy rope. With the cooperation of The Niagara Parks Police, The Niagara Falls Fire and Police Departments and hyrdro workers on the powerhouse roof, they began to move the breeches buoy out to the scow. Part way out the breeches buoy suddenly stopped – causing a loud groan of despair to ripple through the large crowd of spectators watching the drama unfold. It was soon discovered that the stoppage was due to a tangle in the ropes. This problem was not solved until the very early hours of the following morning when William “Red” Hill Sr. offered to go out and correct the problem on the lines. A resident of Niagara Falls, Ontario, Hill was Niagara’s most knowledgeable riverman and a recognized hero who had recently returned home after having been wounded and gassed in France while serving in the First World War. With the beam of a search light following him, Hill courageously went out in the breeches buoy to untangle the lines. When the sun came up, Hill went back out a second time and successfully untangled the lines. With all problems now solved, the two men were safely brought ashore, with James Harris reaching the powerhouse roof at 8:50am, followed by Gustav Lofberg about an hour later. A salvage operation to recover the scow was not considered feasible and so, although considerable deterioration has taken place, the scow still clings to its rocky perch.